Collaborative Economy startups like Airbnb and Uber will play a major role in changing the economic culture if they continue at their current growth rate. 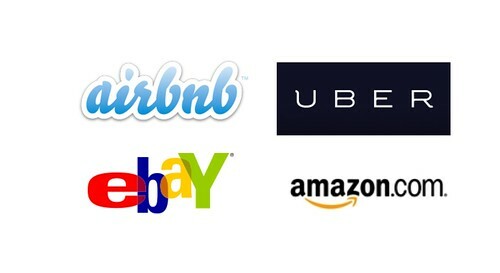 Airbnb could be the next eBay, and Uber could be the next Amazon. You’re probably familiar with the global news about Airbnb and Uber. On July 20th, Tom Friedman featured Airbnb in his column in the New York Times. Uber is in the process of raising additional funds beyond their apron $57 million, thrusting their market value into the billions. That’s just now. Let’s see what happens when we forecast what the future of these two companies might be. From global to personalized-local. Stemming from the public’s growing desire for local experiences and for eliminating the costs of global shipping, the driving force in the global marketplace for local, personalized experiences will continue to increase. Economic models demonstrate that purchasing items at the local level is cost-efficient, thus favoring this trend. From ideas & media to goods & services. The first phase of social connection was the sharing of ideas and media. PR, media, journalists, marketers, and communications at governments were radically disrupted. The next phase is already using the same tools to share goods and services. We are seeing it happen. From corporations to crowd-powered institutions. This trend, where the people in the crowd connect to each other using these sharing startups, enables people to get what they want from each other, rather than using traditional corporations. I’ve even documented the true story of a crowd building a 100 mpg car, and selling it legally. From latent delivery to on-demand. Amazon delivery of 3-5 days, or even overnight, will begin to feel slow, as on-demand services, like Uber, make renting a car happen in real time. Last night, I had to wait for five minutes for my car, before traversing San Francisco. So how do Airbnb and Uber deliver on these overarching trends? Airbnb delivers personalized, local experiences, powered by the crowd. They provide that personalized experience at the local level of properties and experiences available to rent, but have an inventory that spans the globe. In fact, the New York Times has reported that Airbnb is putting 200,000 heads in beds per night, and they’re still in their formative years. It’s local and specialized, and often less expensive than hotels. The future state of Airbnb could go beyond just beds, disrupting eBay. This is a massive marketplace that can add any product mix that the crowd wants. I imagine the next natural phase for Airbnb is to help restaurants, local retailers, and artisans to provide services to guests at Airbnb facilities, and then to everyone else – all at the local level. Need a new shirt? Use Airbnb. Need more furniture for the guest room? Use Airbnb. Need a place to eat in your neighborhood instead of a restaurant? Use Airbnb. Uber delivers services, and now goods, on demand. On July 18th, the Huffington Post reported that Uber put its toes in the water of delivering physical goods at the local level, on demand. By simply pushing a few buttons on your iPhone, you could summon an ice cream truck in the heat of summer to your location, supplying cold confections for you and your friends – all on demand. Imagine what will happen when they activate this service for delivering groceries, shirts, and meals. The future state of Uber delivers anything you need on-demand, disrupting Amazon. I imagine that Uber will expand beyond town cars and ice cream trucks and activate the crowd to become couriers at the local level. Anything you need, on-demand with a push of the button will be made available. As they’ve already been savvy enough to provide helicopters to wealthy people in Manhattan who wanted to find a way around the traffic to get to their mansions in the Hamptons, or ice cream during a heat wave, they know how to seek out inventory that’s readily available and make available, on-demand. Welcome to the Collaborative Economy. Instead of relying on Amazon or eBay, the crowd can turn to Airbnb and Uber to get durable goods, media, and products at the local level and on-demand. Welcome to the Collaborative Economy where the people in the crowd can get what they want from each other, faster, cheaper, and in a more personal way than our industrial institutions can provide. If you’d like more information, start with our open research report on the Collaborative Economy. Update: Discussion on Facebook with smart folks is occurring, and I cross-posted on Huffington Post.